Is your New Year's resolution to be more fit? More active? To increase your health? We want to help you make your resolution! 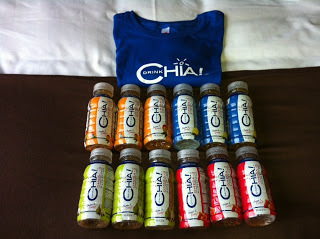 Enter below for your chance to win a CASE of Drink Chia! I don't really make New Year's Resolutions, but one of my goals is to continue eating healthy foods and staying active and fit! to work on my fitness. i've really let myself slide! I want to lose weight, get pregnant. I made a Resolution over 20 years ago to NEVER make a New Year Resolution... and it worked! To hang pictures on my bare walls! My New Year's Resolution is to exercise consistently, especially around holidays, birthdays, etc. Start and finally finish p90x! My resolution is to exercise daily. Drink more water! Would enjoy trying chia water too! Thanks! I'm going to commit to regular exercise instead of bingeing and then having long droughts. My resolution is the lose weight. to eat more greens, salad with every dinner. To get my pottery studio up and running by July! My resolution is to stay on schedule! Be a more orderly housekeeper! I want to exercise on a regular schedule. Start exercising more. Taking walks with my son in his stroller would be perfect if only the weather would permit! To walk at least a mile everyday and get some fresh air! To increase my fruit and vegetable intake. Lose weight! Well, get healthy, and chia seeds are on my to do list! My resolution is to be less type A and learn to relax. My resolution is to get rid of those last 10 pounds that are leftover from last years resolution! To volunteer more of my time to others as many have done sp for me in 2012. Read Bible daily and exercise. To lose the 25 pds I gained in 2012. Ugh. To be the best me I can be! To get back to my pre pregnancy weight and to spend as much time as possible with my boys making happy memories and to learn to let little things in life go.. I'm trying to cut out refined sugar, white flour, and hydrogenated oils. New Year's resolution is to exercise more. to not yell or raise my voice when angry anymore!! My resolution is to run a faster 5k. to walk every day for the exercise and fresh air. Be more organized, stretch every morning. Use LIFT app on phone to keep track of my habits. Limit the amount of sodas I drink! Cooking and eating in instead of grabbing fast food or eating out. I am going to try to be more consistent in all the areas I need to work on. I tried Chia yesterday, it was a little like drinking jello. Not bad at all. To have a healthier body and a healthier savings account. Thanks! I would totally have entered this giveaway if their product didn't contain exaporated cane juice :( It's just as bad as refined sugar, other wise the product looks great! Just some feedback to pass along to the company. My resolution is learning how to deal with stress and stay healthy! To start each day with a confession of love and gratitude. to lose weight and finally keep it off!